Moonlight Departure - The Frigate Aimable passing the old castle at the entrance to Dartmouth. Born in 1923 and educated at Mill Hill, Roger Desoutter went on to obtain a degree in engineering at Loughborough; after which he was chosen, in 1942, to join the team of Sir Frank Whittle, engaged in the design and development of the first jet engines, which occupied him until 1945. Most of his spare time during this period was making sketches in pen and ink, and pastels, as well as producing technical drawings for engineering publications. He had to abandon all hopes of a full-time artistic career in 1947, when the unexpected death of his father necessitated his joining the family medical engineering business. He married in 1950, and was encouraged by his wife to devote all his spare moments to the study of oil painting, resulting in a number of his works being exhibited and sold for the first time at the Guildhall Annual Exhibition of the Society of Aviation Artists in 1955. In the years to come, Desoutter sought to extend his talents in painting and turned his attentions from aeronautical studies to encompass landscape and marine subjects. Inspiration for many of his landscapes was drawn from his experiences as a child spent with his French parents, his grandfather originally emigrated from Normandy in 1888. He was greatly affected by the feeling of space and the endless vistas of the flat countryside, and tall sentinel rows of poplars lining the avenues that wound away to the horizon. The paintings of a French post-impressionist, Alexandre Jacob, born in 1876, made a lasting impression upon Desoutter and his influence has remained to this day. Jacob was enthralled by the same effects of the winter sunlight upon deeply fallen snow and the ice bound rivers, held in contrast with the stark trunks and leafless branches of the trees together with the snow-laden hedgerows. In 1962 he acquired a boat, becoming a keen amateur yachtsman, at the same time revealing to him a new dimension in marine art. Desoutter feels that having a boat is an invaluable aid and that it is essential to go to sea and experience the elements at first hand, in order to achieve a credible understanding and success in marine painting. He is particularly fond of painting the areas around estuaries and coastal inlets, tranquil scenes painted at sun down or in the early morning, showing expanses of wet sand reflecting the light, often with beached boats waiting for the tide. 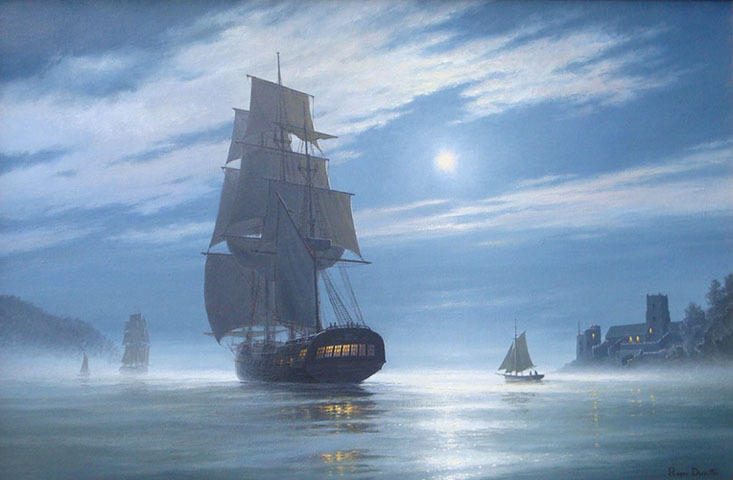 He has exhibited regularly at the Royal Society of Marine Artists since 1974. The discipline of marine painting calls for great accuracy of detail concerning ships and their rigging, and Desoutter painstakingly researches his subject before he paints it. His paintings have been sold internationally, in Canada and America, where the demand for historical marine subjects is high; a work depicting a wartime convoy has been acquired by the U.S.Merchant Marine Academy in New York. A number of his paintings are in private collections in this country as well as in Australia, Spain, Norway and West Germany. 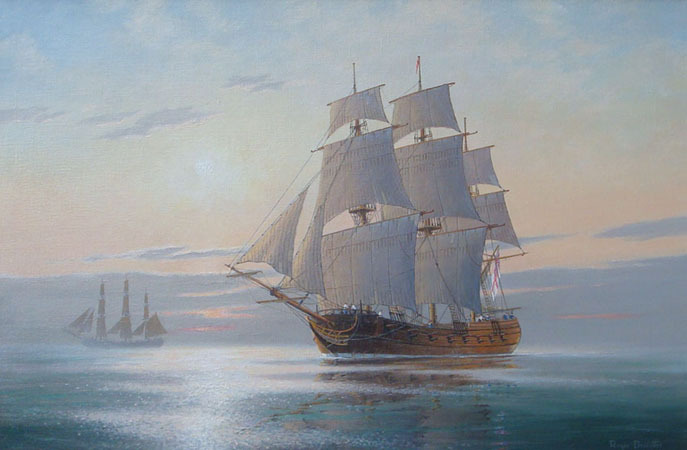 Two of his paintings have been reproduced in Denys Brook-Hart's authorative book ‘20th Century British Marine Painting’. Paintings may be viewed in London or Wiltshire by arrangement; higher resolution images are available on request. All images in this gallery are copyright Roger Desoutter - no reproduction without permission. The Rattlesnake - Oil on canvas.